I know most of you ,weekend is important for me, to spend time with family and do things together. Basically, I run the show every weekend at home, plan where to go and things to do for the family. Hubby and I had open communication and agreed about our weekend.If hubby and I can't decide, then Little Travelentz will help to make a decision on our weekends. 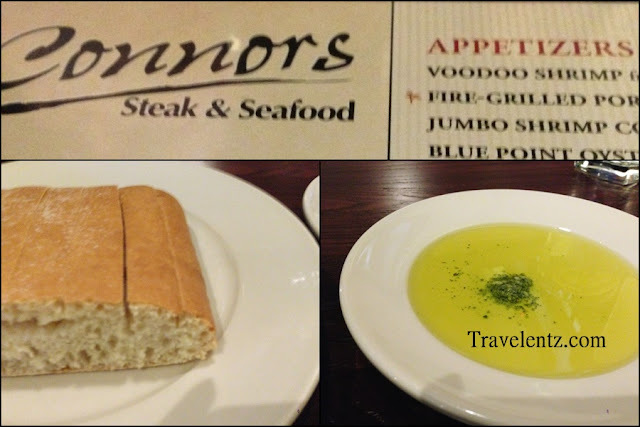 Connors Steak and Seafood, Franklin, Tn is newly open restaurant in the area. It is located in Cool Spring where the Mall is. Hubby and I like to eat seafood and so Little Travelentz.It's our first time to dine-in, then, early dinner were my family option to beat the crowd. The ambiance is inviting and the decor is more in modern industrial and rustic looking which attracts me. I would definitely plan to go back and bring my in-laws when they're around. Staff is friendly and accommodating and willing to help you- it is our first time, then they explain to us what's to order. The only thing we're disappointed is about the oysters-no option in-terms of how they cooked it like baked or grilled. Complimentary bread when we dine-in.It was good. I don't eat it, hubby enjoyed the oysters by himself. It was so good. Definitely will coming back in Connors Steak and Seafood.This would be included in my favourite restaurants in Franklin,Tn.You can find my foodie adventure for more here. When your car is having trouble making it off the freeway, or you roll out of your driveway with a flat tire, the last thing you want to worry about is whether your mechanic is reliable or not. You want to simply know and immediately trust the person who is supposed to fix your car. But the reality is, there are mechanics out there who would rather make a quick buck with sloppy, temporary fixes. Lucky for you though, there are those in this line of work who fit the bill of both reliable and reputable, making your life a whole lot easier. Read on for 3 helpful tips on hiring a reliable, reputable mechanic to work on, and ultimately fix, your automotive issues. When service is good, customers will leave a beaming review for others. The same goes for when service is bad. Most of the time, you can check major automotive websites, like Meineke auto care, to gauge whether their mechanics will be a good fit for you and your vehicular needs. If you need to form your own opinion, go to an automotive care facility and ask to speak with the master mechanics. First impressions are usually spot-on, so you will easily be able to decide whether you trust your potential auto tech. You have every right to be picky. One of the biggest complaints from mechanics is that their customers know very little about their own cars. You drive it regularly. It is yours. You should know the basics of your own vehicles, like the year, make, model, and what’s under the hood. Most mechanics will also take the time to explain things to you about your car, but it is good to have general knowledge so you can follow along with what they say. If you are searching for a regular auto technician, consider taking your car somewhere for a basic tune-up. This is a small way you can gauge the reliability of a prospective mechanic without sacrificing your vehicle. Start small with something like a bulb replacement, oil change, tire rotation, or routine inspection. It is completely within your power to ensure you hire a good mechanic; one who genuinely cares about your safety and the condition of your car. Luckily, they aren’t difficult to find if you utilize the aforementioned tips. The town of Jaco is on beach in Costa Rica. If you are planning a trip to Jaco, a website with information about accommodations and activities in the area will be very helpful. You can use this site to help you decide if you want to stay at an all inclusive resort Costa Rica or at a condo on the beach. Your five-day fishing vacation will begin when a luxury van takes you from the airport to your condo or penthouse. If you purchase the luxury package, you will stay in a three-bedroom condo with an ocean view. Accommodations for those who purchase the premium package are in a four-bedroom penthouse. Both packages include two days of fishing and a day of relaxing. Your vacation will end with a trip back to the airport in a luxury van. Both surf packages that are offered include transportation to and from the airport in a luxury van. A five-night stay in a two-bedroom oceanfront condo and three surfing lessons are included in both packages. Yoga is part of one package, and you can choose an outdoor activity if you purchase the other package. These activities include mountain biking or horseback riding. Airport transportation in a luxury van is part of this six-day package. Your family will stay in a two-bedroom condo on the beach. Outdoor activities include riding a zip line in the rainforest and exploring beaches in an all-terrain vehicle. You will also see animals at a national park and relax on one of the country's loveliest beaches. If you are interested in a romantic getaway, you can enjoy a private dinner on the beach at sunset. A trip to a national park and a visit to a beautiful beach are also included. This six-day trip also includes a massage and a day to relax. A luxury van will take you to and from the airport. 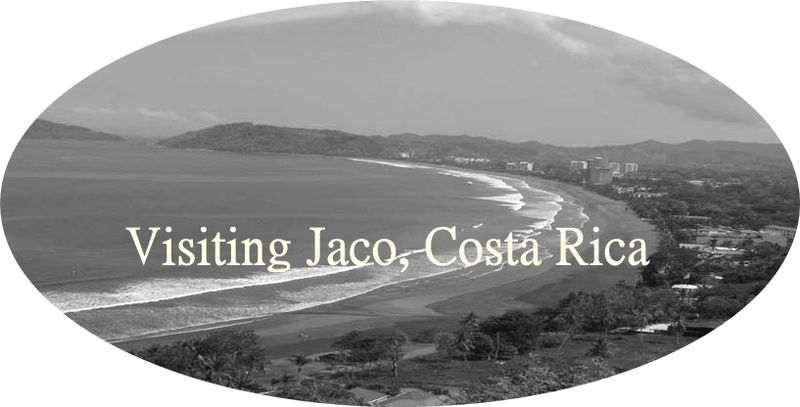 Looking at these promotional packages on the website will give you an opportunity to learn about the variety of things to do during a vacation in Jaco.